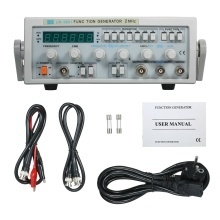 This series of instrument is a signal generator with features such as highly stable, broadband and multi-function. The design of appearance is strong and elegant. And it is easy to operate, could directly generated sine wave, triangle wave, square wave, ramp, pulse, and has VCF input control functions. TTL/CMOS can be as synchronized output with the output. The adjusted wave from is symmetry and have reverse output, DC level can be adjusted continuously. Frequency meter could be as the display of internal frequency and measure the outside frequency. It is particularly suitable for teachings, scientific researching and experimenting of electronic and pulse circuits. Frequency of the mode: 0.1Hz—2MHz. Output waveform: Sine, Triangle, Square, ramp ±Pulse. TTL/CMOS and OUTPUT synchronous output. Less than 1% distortion at 10Hz-100KHz. Less than 0.5dB frequency response at 0.1Hz-100KHz. Less than 1dB frequency response at 100KHz-5MHz. Less than 1dB frequency response at 100KHz-2KHz. The design of appearance is strong and elegant, easy to operate. It is particularly suitable for teachings, scientific researching and experimenting of electronic and pulse circuits. TTL low level less than 0.4V in pulse wave, high level less than 3.5V,CMOS low less tan 0.5V in pulse wave, high level than 3.5V,CMOS low less tan 0.5V in pulse wave, high level 5V–14V continuously variable.